Ambrey are unique in the PMSC market as, unlike other maritime security providers, we operate and control our own transfer vessels. Located at 17N Red Sea and 25N Gulf of Oman, our two vessels are former Dutch pilot boats built in 1977 and 1978, refitted in 2017 following a substantial investment to refit the vessels to the highest standards. Owning our own vessels, both licensed by the UK Government to operate as floating armouries, gives us complete control over our supply chain – from the vessels themselves to the people and equipment on board. This allows us to offer our clients a certainty about the quality and consistency of our services that’s unique in our industry. 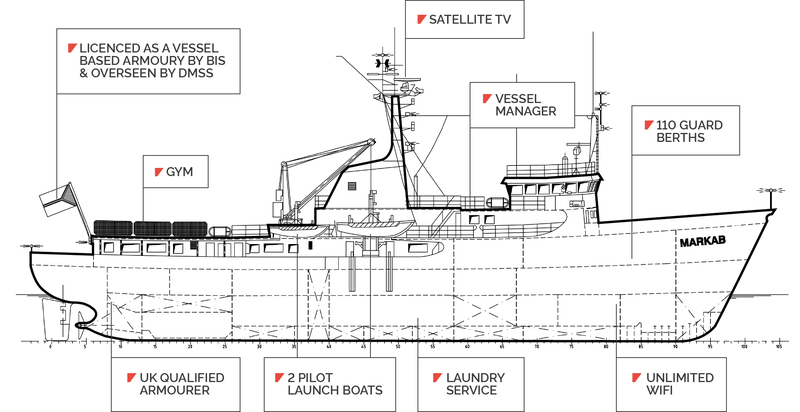 Both vessels can comfortably house up to 110 guards and each offers satellite sports channels, high-speed Wi-Fi and a gym. Each vessel also has two diesel inboard engine tender boats, deployed from individual davit cranes, which are much stronger than most conventional RHIBs. This makes them better-suited to operating in the more aggressive sea states, as it reduces the impact of turbulent weather on transferring teams and equipment to client vessels, which in turn minimises the chance of delays. In fact, Ambrey has the lowest rate of weather-related delays in the industry. The two floating armouries are also sister ships, which provides considerable advantages to our in-house ship-management team. All of our accommodation cabins have been recently refurbished.